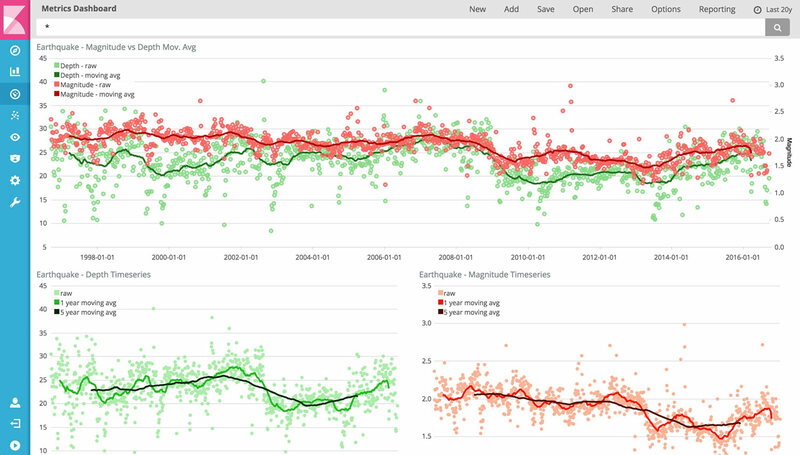 Today, we will introduce Kibana, a data visualization open source tool. 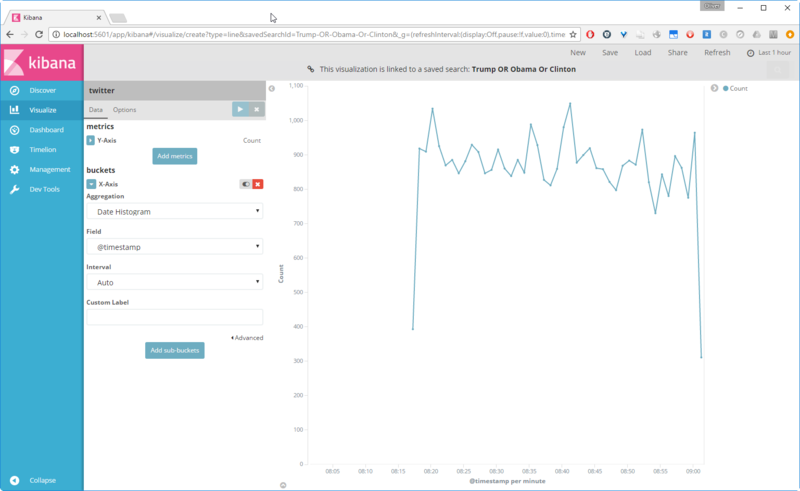 As part of Elastic’s ELK stack (now called Elastic stack), Kibana is often used to visualize logging statistics and for management of the Elastic Stack. However, in this Tutorial, we will analyze statistical data from Twitter by comparing the popularity of Trump vs. Obama vs. Clinton. But now let us get back to the technology topics. 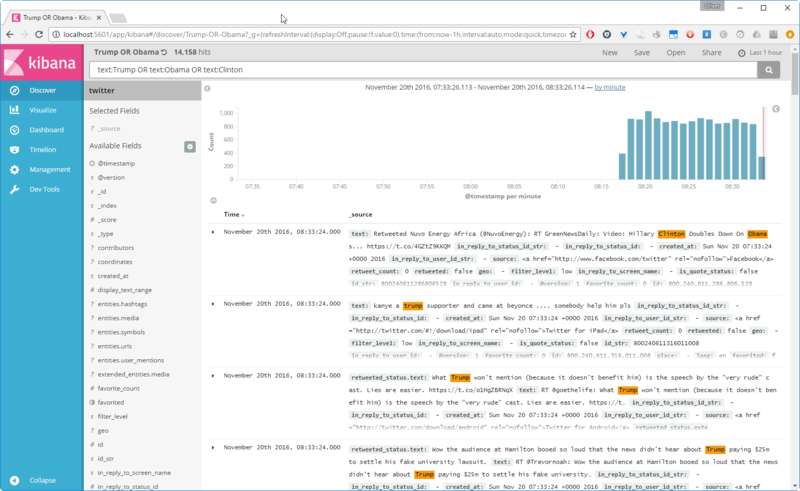 Kibana is a tool for visualization of logging statistics stored in the Elasticsearch database. 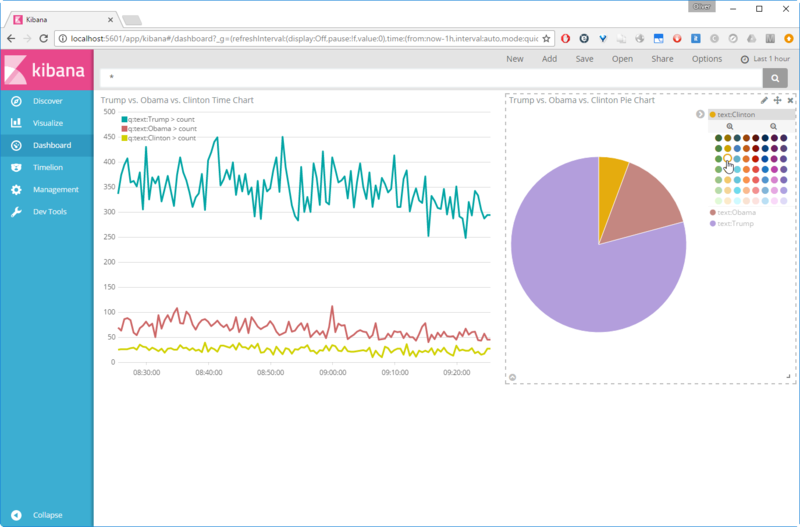 Statistical graphs like histograms, line graphs, pie charts, sunbursts are core capabilities of Kibana. This will allow us to analyze the number of Twitter tweets with certain keywords in the text. The max virtual memory areas vm.max_map_count must be at least 262144, see this note on the official documentation. See also Appendix B below, how to set the value on Linux temporarily, permanently and also for the next Vagrant-created Linux VM. We will run Kibana, Elasticstack and Logstash in Docker containers in order to allow for maximum interoperability. This way, we always can use the latest Logstash version without the need to control the java version used: e.g. Logstash v 1.4.x works with java 7, while version 5.0.x works with java 8 only, currently. If you are new to Docker, you might want to read this blog post. I recommend to have direct access to the Internet: via Firewall, but without HTTP proxy. However, if you cannot get rid of your HTTP proxy, read this blog post. Administration rights on you computer. Now you are logged into the Docker host and we are ready for the next step: to create the Ansible Docker image. Note: I have experienced problems with the vi editor when running vagrant ssh in a Windows terminal. In case of Windows, consider to follow Appendix C of this blog post and to use putty instead. We are using version 5.0.1 currently. If you want to make sure that you use the exact same version as I have used in this blog, you can use the imagename kibana:5.0.1 in all docker commands instead of kibana only. After successful start, Elasticsearch is waiting for data. But how do you find your personal consumer_key, etc? For that, you need a Twitter account, log in and create a new app on https://apps.twitter.com/. Note: this works only, if you have registered your mobile phone with the Twitter account on Profile -> Settings -> Mobile Phone. The Website must have a valid URL format, even if you add a dummy address there. The consumer key and secret can be accessed on the “Keys and Access Tokens” tab of the page you are redirected to. We do not want to send any tweets, so we can set the Access Level to “Read only”. Then, on the “Keys and Access Tokens” tab again, create an access token by clicking the button at the bottom of the page. 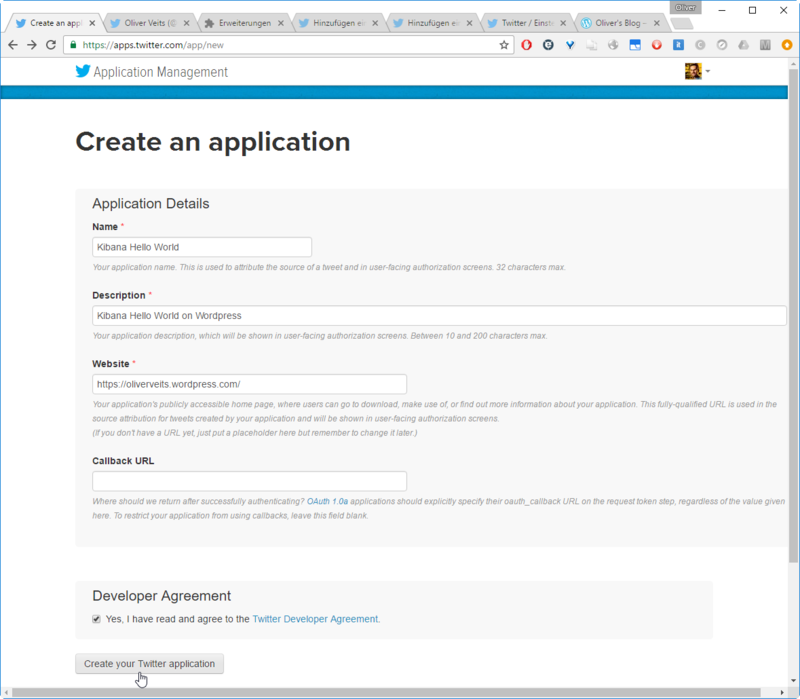 Then copy and paste the keys to the configuration file logstash_twitter.conf we have created above. The number of tweets is rising quickly. While performing the next steps, we keep Logstash and Elasticsearch running, so we have a good amount of data entries to work with. In this step, we will run Kibana interactively (with -it switch instead of -d switch) to better see, what is happening (in the Elasticsearch blog post, I had some memory issues, which cannot be seen easily in detached mode). [WARN  tini (5)] Tini is not running as PID 1 and isn't registered as a child subreaper. Zombie processes will not be re-parented to Tini, so zombie reaping won't work. To fix the problem, use -s or set the environment variable TINI_SUBREAPER to register Tini as a child subreaper, or run Tini as PID 1. If you see errors at this point, refer to Appendix C.
In our case, Kibana is running in a container and we have mapped the container-port 5601 to the local port 5601 of the Docker host. On the Docker host, we can open the URL. We change the index name pattern logstash-* by twitter and press Create. 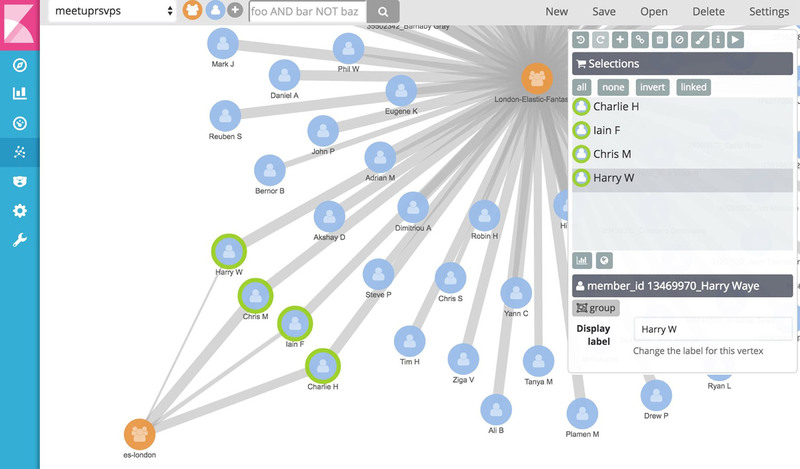 All matching entries are listed, and the matching strings are highlighted. Let us press Save and give it the name “Trump OR Obama OR Clinton”. This is not so interesting yet. Let us now click Split Slices, choose the Filter Aggregation and add the query text:Trump. Then and text:Obama. The same for Clinton. After that press the white on blue triangle to apply the changes. That looks better now. Let us save this as “Trump vs. Obama vs. Clinton Pie Chart”. 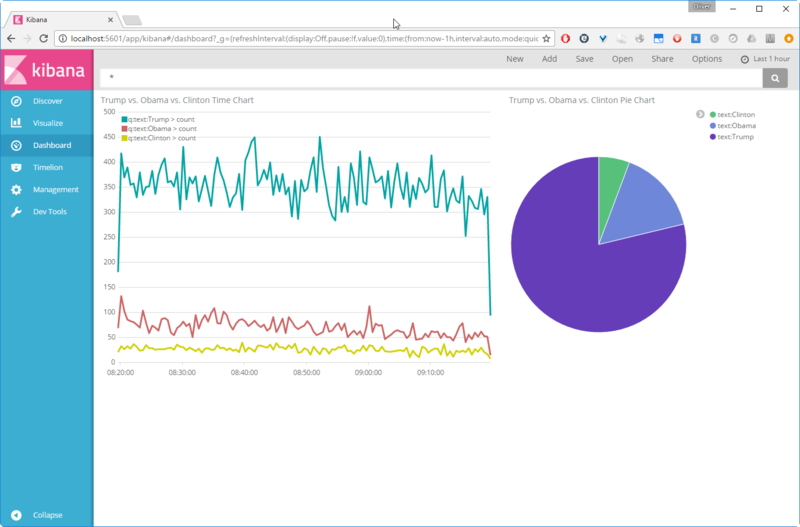 We would like to display all three queries in a single graph, and this requires the usage of the Timelion plugin. 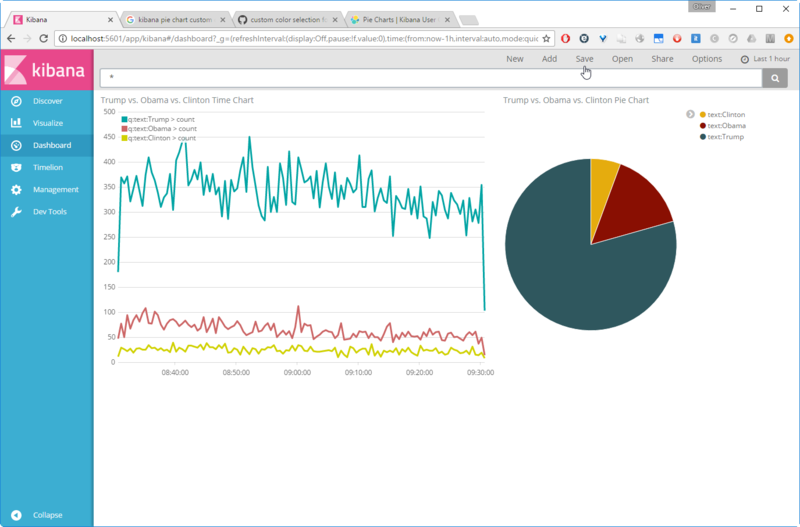 Let us save this as a Kibana dashboard panel with the name “Trump vs. Obama vs. Clinton Time Chart”, so we can use it in the next step. We now will create a dashboard. Click on on the left pane and click in the upper menu. Click on and then on . Clicking the white on black icon will give you more space. 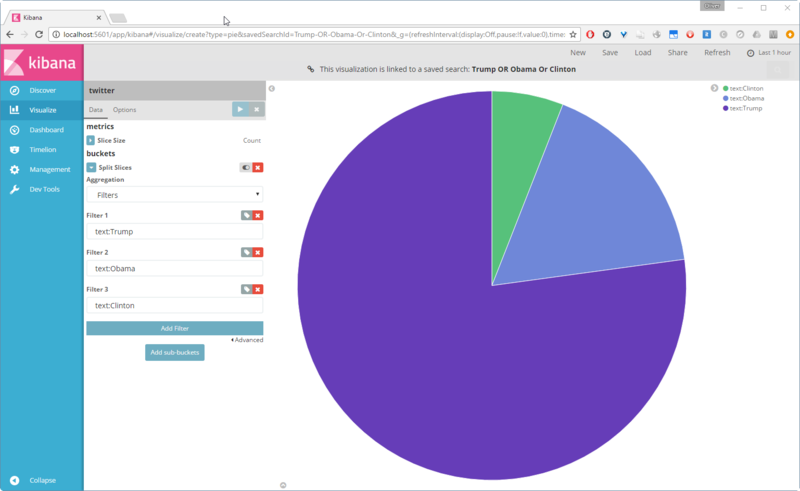 However, the colors of the Pie chart can easily be changed by clicking on the legends (it is not so easy on the Time chart, though). Let us this as “Popularity of US Politicians” dashboard. 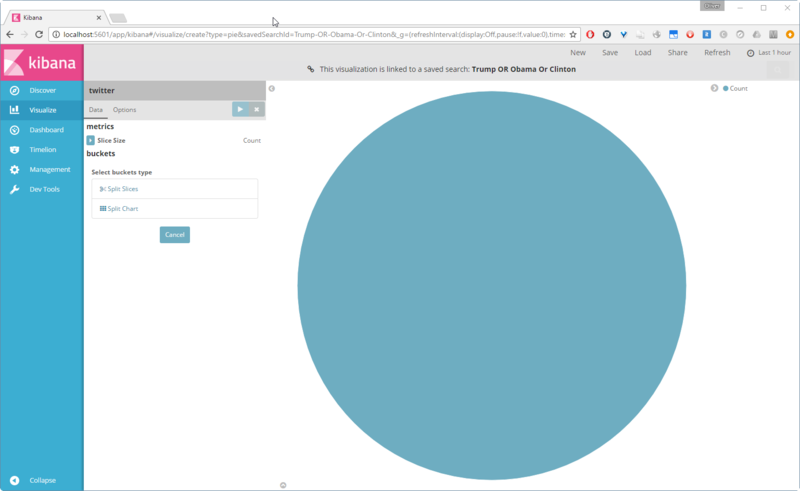 use Kibana to visualize the Elasticsearch search queries. 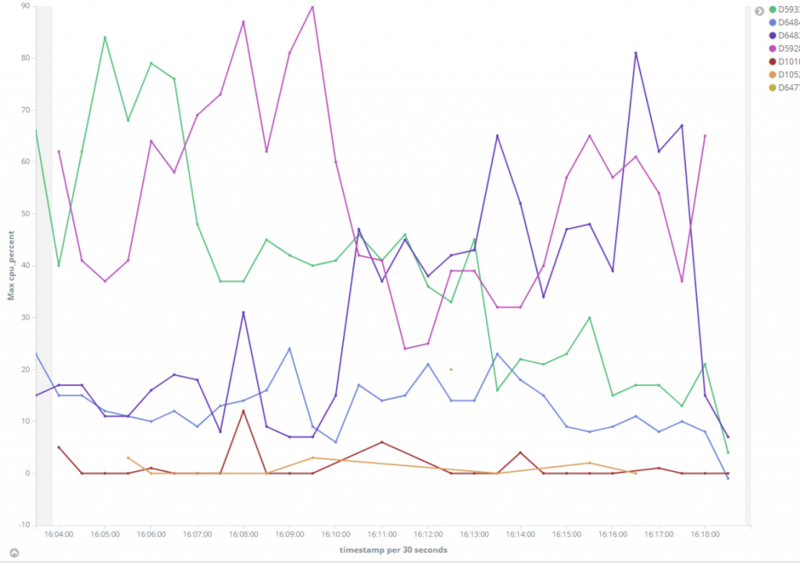 We can see the rise and fall for the number of tweeds during a day and we also can see that the number of Trump tweets is outpacing those of Obama tweets and Clinton tweets by far. We also can use hex color codes like .color('#ff0000') instead of color names. This error has been seen by running Elasticsearch as a Docker container on a Docker host with only 250 MB RAM left (as seen with top). increase the value of vb.memory in the Vagrantfile line, e.g. Update the vm.max_map_count setting to 262144 or more in /etc/sysctl.conf. To verify after rebooting, run sysctl vm.max_map_count. config.vm.provision :file, :source => "elasticsearchpreparation.sh", :destination => "/tmp/elasticsearchpreparation.sh"
The sed and chmod commands make sense on Windows hosts in order to make sure the file has UNIX format and and has the required rights. Also here, make sure to run sysctl vm.max_map_count in order to check, that the configuration is active (might require a reboot). 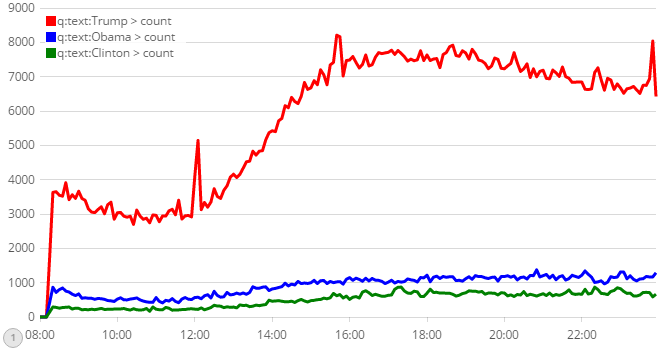 At this point the system has connected successfully to Elasticsearch, as can be seen in the last three log lines above. To correct the issue, make sure that the Elasticsearch server (or container) is reachable from the Kibana server (or container). [WARN  tini (8)] Tini is not running as PID 1 and isn't registered as a child subreaper. log   [17:06:57.798] [error][status][plugin:elasticsearch@5.0.1] Status changed from yellow to red - Unable to connect to Elasticsearch at http://elasticsearch:9200. To correct the issue, make sure that the Elasticsearch server (or container) is reachable from the Kibana server (or container), that the Elasticsearch process is started and the port is reachable from outside. This may involve to map TCP ports from inside networks to outside networks. In the example of this blog post, the container port is mapped with the docker run -p9200:9200 switch from the container to the Docker host, and then the Docker host port is mapped via Virtualbox forwarding from the Docker host VM to the local machine. 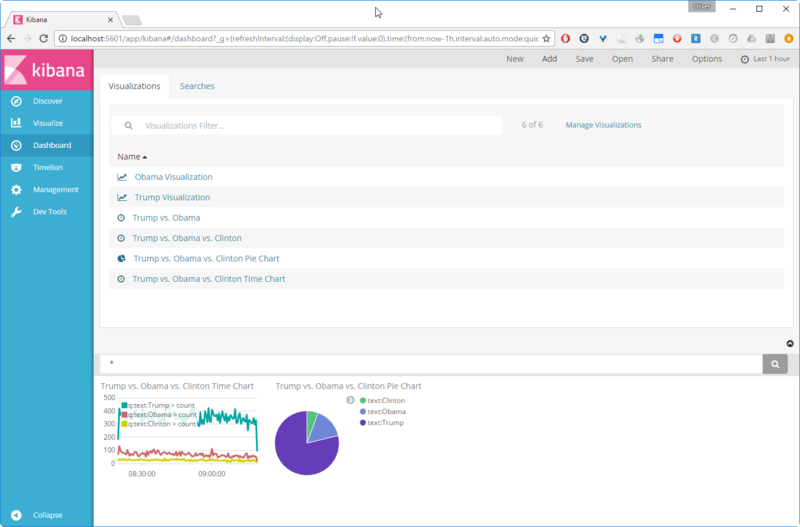 attach Kibana to Elasticsearch and visualize the statistics on how often the text pattern “Obama”, “Trump” and “Clinton” is found in the recorded tweets. The total number is shown in a Pie Chart and the date/time histogram is shown in a Line Chart with more than one search term in a single chart. The latter can be done by usage of the Timelion plugin. In order to avoid any compatibility issues with the java version on the host, we have run Kibana, Elasticsearch and Logstash in Docker containers. In order to better see what happens under the hood, we have chosen Docker containers in interactive terminal mode. In the course of the Elasticsearch “Hello World” in the last blog post, we had hit two Memory resource issues: too low memory and too low number of mapped memory areas. Those issues and their workarounds/solutions are described in Appendix A and B here and in the last blog post. The Elasticsearch Examples can be found on this GIT repository. Logstash “Hello World” blog post with Docker Containers. 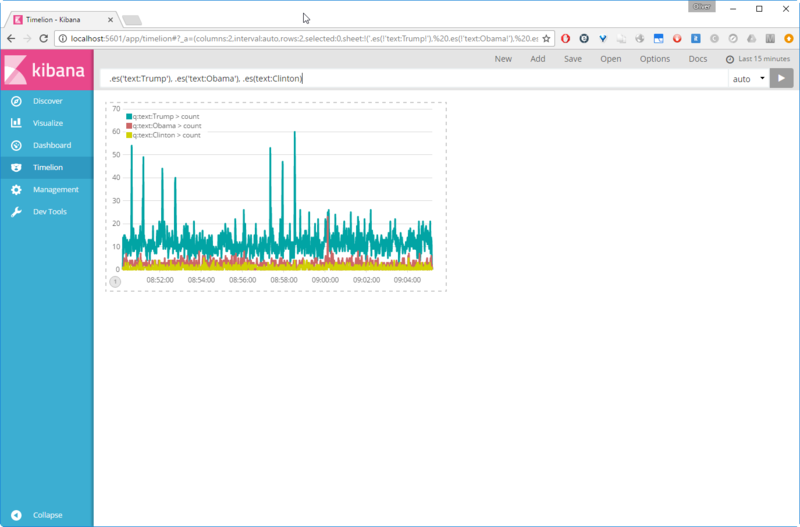 Elasticsearch “Hello World” blog post with Docker Containers.